The following a review of the AppStore application PIngChat. If you are a developer and want to get your AppStore application reviewed see our here for Get your Apple AppStore apps reviewed. You have that friend who owns an iPod touch/iPhone/iPad/BlackBerry/Android phone just like you and you want to message him something. What do you do? You head over to Facebook or your E-mail client and fire him a message. And now the eternal wait starts because chances are that it will take him exactly 1 minute more than the time you will wait for him to check his message/mails and by the time he replies back you’ll be engrossed in doing doing something else. So that it fail. Epic Fail. Of course you can send him/her an SMS but there are 2 problems with that: A.) It is not free B.) What if your friend (or you) have an iPod touch? 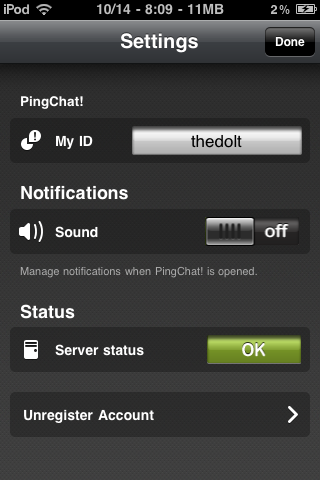 Now enter the application which I have been using since the past 1 year (almost), PingChat! 2.0. PingChat! 2.0 is one of the apps that I install the moment I am finished restoring my iPod touch (which happens A LOT). It has helped me a lot! It connects me with my friends who don’t have a cell phone and friends who never get their phones recharged. It also notifies the user about an IM which he/she has received! (sound +message) This is what the official website has to say about the application. Group Chat –Ping a group of friends with a single message. Your chat history will display everyone’s reply. Link your friends to your address book to view their contact photo. Message Confirmations –Get confirmation when your pings have have been received. The message is confirmed right on the message. You won’t have to guess if your friends got your ping. Multimedia Support – Enjoy unlimited media sending with photos, videos, voice notes, contacts, and maps! Don’t forget about emojis – PingChat! also supports fun smileys and other emoticons. Simple and Beautiful User Interface –Impress your friends with the beautifully simple user interface. See how easy it is to connect with your contacts in a sophisticated but initutive way. 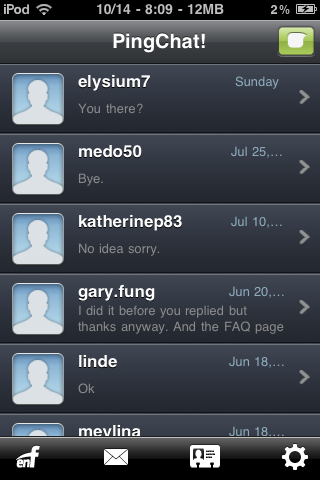 PingChat is this free Instant Messaging Service which is used my millions of users (really?) and is currently available for BlackBerry, Android and iOS. I say grab this application now! My Rating: 4.7/5.0 (Cut three due to slow start up time and inability to figure out how to upload profile picture). 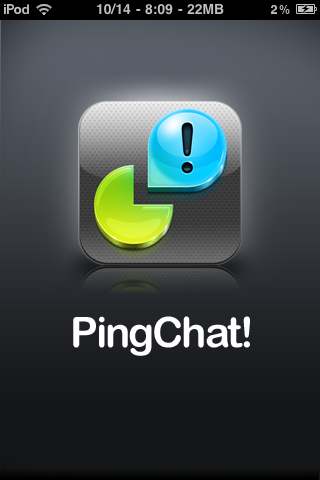 Download PingChat for iOS from App Store now! And all this while I was thinking that I could somehow upload my own image from my own iPod touch so that anyone who adds me will be able to see it. What a dork I was!